SCR2 N-42 Titan Tankless Water Heater Discounts Apply ! This is a low power unit designed for point of use applications, such as a small sink or lavatory. It will not provide sufficiently hot water for a shower. 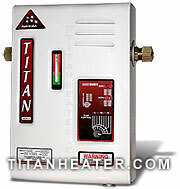 The Titan SCR2 N-42 continually heats water instantaneously as you require it - and only when you require it. This unit is highly recommended in areas with warm climates where the incoming water temperature is above 70° degrees Fahrenheit.